Francis Tucket's life has been exciting ever since his family headed to Oregon in a wagon train. First he was kidnapped by Pawnee Indians. Then Mr. Grimes, a one-armed mountain, man rescued him and taught him wilderness survival skills. Later when Francis set off alone to find his parents on the Oregon Trail, he ended up rescuing two young children stranded in the barren land. Now in Tucket's Ride, winter is forcing 15-year-old Francis to take Lottie and Billy south to avoid snowy mountains. Soon they are in the midst of a war between Mexico and the United States! But Francis' troubles really begin when they meet up with the West's most ruthless outlaw band, the Comancheros. 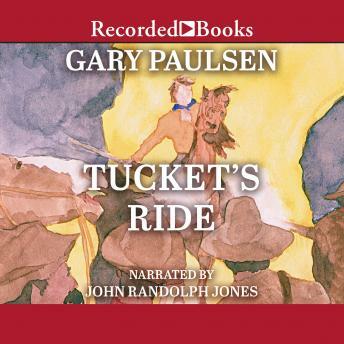 Newbery Honor winner Gary Paulsen spins tales of the American frontier in the 1840s with realistic details and gritty honesty. Tucket's Ride continues Francis' action-packed adventure series that begins with Mr. Tucket , then Call Me Francis Tucket.